By far, the cards that I give most often are birthday cards. This birthday balloon card took quite a while to work through. Unfortunately I didn’t photograph my first attempts so I’ll describe them. The original inspiration came from a pin on Pinterest. This was during my very early stages of card making so my card is pretty much an exact duplicate of the card that inspired me. Most people learn to cook by following recipes or to sew following a pattern. In my case, I scoured the internet for ideas that inspired me and could be done with the very limited supplies that I had in my tiny stash. For my first attempt, I used an A2 (5 1/2″ high x 4 1/4″ wide) card base and a 1.5″ circle punch. It became clear pretty quickly that by using the 1 1/2″ punch I wasn’t going to be able to include very many balloons. My next try was using a much larger 8 1/2″ x 5 1/2″ card base and the 1.5″ circles I had already punched. Again, I couldn’t get the positioning to look right and I was going to have to use way too many balloons. It looked ridiculous! So, back to the drawing board I went. At this time I was still trying to figure out standard card sizes and basic concepts so I printed a scale picture of the inspiration card and laid out my design over top. By doing this, it became immediately obvious that I needed to use a 1″ punch and A2 card base. I was finally making progress! For the final card, I used 24 1″ circles of various colours using paper that came from a craft box I had left over from my childhood. Using the picture I printed, I lay the circles down in the pattern and then used a glue stick to stick them together one at a time. Next, I flipped them all over and secured the rows together using tape to make the “bunch”. I used 8 pieces of bakers twine (from Michael’s) as the strings by securing them on the back of the balloon bunch, again with tape. I left the ends long and trimmed them at the very end after I had assembled the whole card. I used Recollections (Michael’s brand) Craft cardstock as the card base (cut to A2 size) and some purple cardstock, again from the childhood craft box, cut to 5 1/4″ x 4″, and then a piece of Salt embossed dot paper from Michae’s cut to 5″ x 3 3/4″. 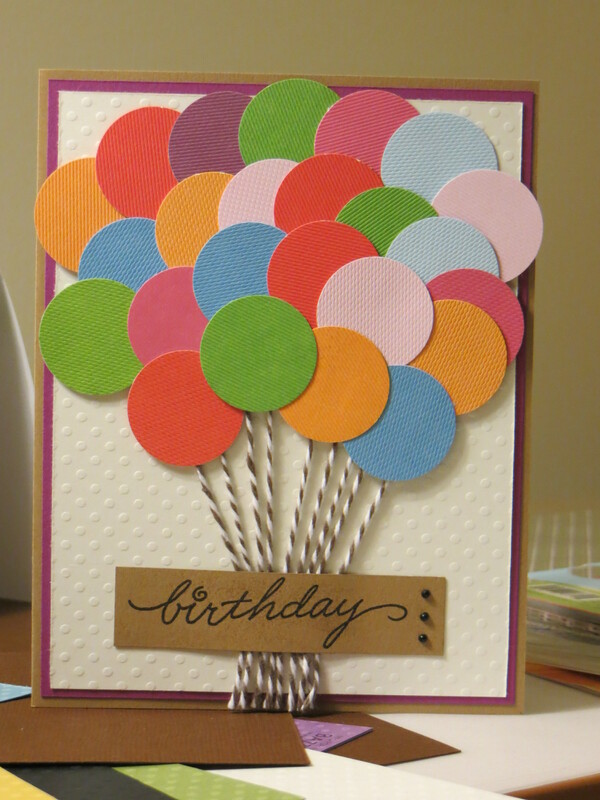 The dot paper mimicked the circles of the balloons and gave the card a more polished look. I adhered the balloons and card layers using photo mounting squares (I don’t use they very often any more, but more on that later) and my glue stick. Next, I stamped the “birthday” sentiment using a black pigment ink on a scrap of Craft paper and heat embossed it with clear embossing powder. I added some small black self adhesive embellishments from my stash after I had stamped so that they would be positioned correctly. I trimmed the sentiment and then adhered it using glue over top of the balloon strings. The last thing I did was trim the strings to the bottom of the card base.